Choosing bird houses whether for Bluebirds, Wrens, or Nesting Shelves for Robins shouldn't be done without thought. Not all birds nest in man-made boxes and not all are built the same. The information below will help you select the best type for the bird or birds you want nesting in your backyard. Nest boxes should be designed and built for a particular type of bird. While it may be tempting to buy that cute one with multiple openings, don't do it. Most wild birds do not nest near others of the same species. Except for Purple Martins, a bird house should be for a single nest. Unless your decision is just to decorate your yard or garden, stay away from nesting boxes built for multiple birds, (duplexes, triplexes). Most likely you won't get any birds to nest in these homes, or worse, you may get less desirerable birds that chase away the very ones you wish to attract. Birds can be very territorial during the breeding season. The size of territory varies with each species. Unless you live on several acres, it's unlikely you'll be able to attract more than one pair of a particular species to your bird houses. No need to be discouraged. 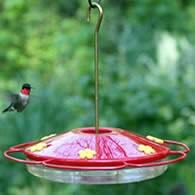 The idea is to attract a variety of birds to nest in your yard. Several nest boxes of the same shape and size may attract just one pair, but using a variety of bird houses can attract many species of birds to nest in your yard at the same time. There are about fifty species of North American birds known to be cavity nesters. Some of the more common ones are: Eastern Bluebird, House Wren, Chickadee, Northern Flicker, Nuthatch, and Purple Martin. Some bird species can be attracted to your yard by using nesting shelves. Unlike bird-houses, nesting shelves are not fully enclosed boxes but usually have a roof, back, bottom, an open front with narrow side walls. Birds that can be attracted to nesting shelves are: American Robin, Barn Swallow, Eastern Phoebe, and Mourning Doves. The entrance hole is very important to consider as not all are created equal. If deciding to attract Wrens or Black-capped Chickadees, the entrance hole can be as small as 1 1/8 inch. This will help keep House Sparrows out which you never want nesting in your houses. House Sparrows will kill native species. 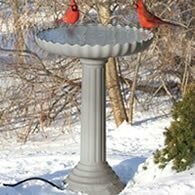 Bluebirds and Tree Swallows need an entrance hole that is 1 1/2 inches. This size of opening allows House Sparrows access so you'll have to monitor the nest box. Floor sizes are also important as some birds may raise 6 or more babies. 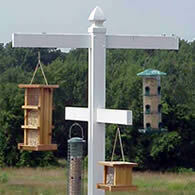 You can find all the sizes for cavity nesting birds on our Building Birdhouses page. If you purchase your nest box from folks who know birds, you shouldn't have much to worry about. As important as picking the right house for the right bird, so too is the maintenance of the nest box. If a bird species raises more than one brood a year, as Wrens and Bluebirds do, it's a good idea to clean the house out between broods. Parasites, blowflies, and other insects can cause harm to future broods. Some birds that raise second broods will not reuse a nest. Others, like the Eastern Bluebird, will use the same birdhouse for up to three broods each season. The best time for a once a year cleaning is late fall or early winter. Be sure to do a through cleaning. When choosing to purchase or build a birdhouse, make sure that there is an easy way to clean it. Most quality birdhouses are built to be cleaned by having sides or floors that either swing or slide out for easy access. Either way, you want one you don't have to disassemble in order for it to be cleaned. It is best not to paint your birdhouse. Personally I prefer nest boxes made from cedar. Cedar weathers to a nice natural silver gray and blends in with nature. Dark paint colors can absorb heat so you don't want them in the sun all day. If at all possible try to get your nest boxes up by late summer or early fall. 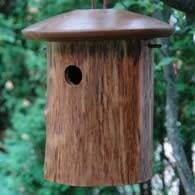 Birds tend to be attracted to birdhouses that have a more weathered look. Which is one more good reason not to paint your nest boxes. If you are unable to get your boxes up by fall, try to get them up as early as possible in the winter. 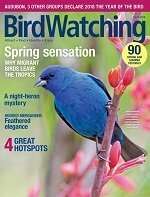 Don't wait until you see the birds in your yard before you mount or hang your nest boxes. No matter what, just get them mounted. Even if you don't get any birds this year, your bird house will have time to weather and be waiting for them next season. 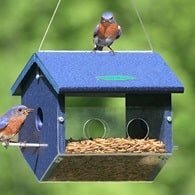 If you are in need of a specific nesting box or more information, you may wish to browse our partners at Duncraft who offer many types of bird houses. If you know where you have some afternoon shade keep this in mind. How much shade you have is important to many birds. But dense shade is not recommended. Most birds prefer a sunny open space with some afternoon shade. It is best not to mount bird houses on the sides of trees where squirrels and cats have easy access. While there is no way to guarantee predators won't get to your nesting birds, there are steps you can take. Consider mounting your nest boxes on post or poles, using squirrel baffles, (devices that detour squirrels) or hanging bird houses from limbs for House Wrens. Bluebirds homes should be placed on a post about 5 - 6 feet off the ground. Predator guards around the opening will help keep raccoons from reaching inside. Bird or Deer netting, available at places like Lowes and Home Depot, and located in their garden centers, should be wrapped around the post to protect agains snakes climbing the pole. (snakes are excellent climbers) Grease will not work at all. A baffle above the netting at 4 feet will keep critters from climbing and should be used with the netting. A baffle will not stop snakes. Nesting Shelves which will attract Robins, Mourning doves, and Phoebes to nest, should be placed under overhangs and eaves. Always monitor your bird houses for undesireable birds and to protect them from predators.